NGO 201 is an issues-based course for those with limited knowledge about the nonprofit-NGO sector and/or the global issues they address. The class will focus on diverse issues and how NGOs handle them. In this course we will use online readings to better understand cause and effect. Case studies will also be used to highlight both problems and approaches. Participants are asked to research NGOs working on specific issues to better understand the methods they use. Participants are expected to be active in class discussion, take part in group-work and make a final presentation on a problem and NGO of their choice. 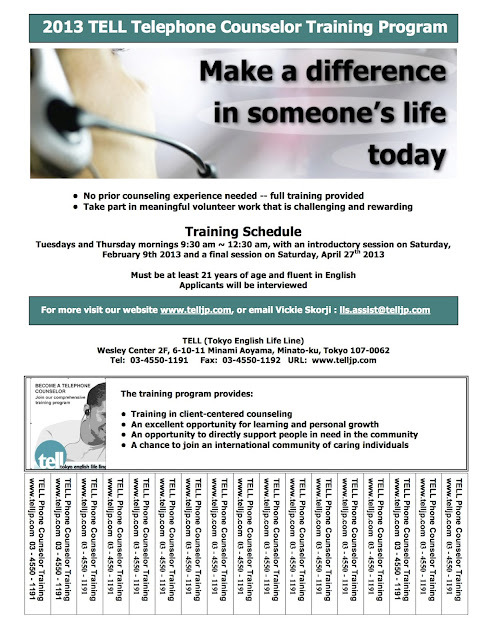 TELL will offer the Life Line Telephone Counselor Training this Spring, starting February 9th. This is a morning program, mostly Tues and Thurs 9:30am-12:30pm, at the Wesley Center in Minami Aoyama, and will offer training in client-centered counseling, as well as a chance to directly support people in need in the community. Asian Disasters Worsened by Climate, Migration Exacerbated by climate change, urban migration, and lack of preparedness, natural disasters in Asia are growing in severity, frequency and damage. During the first 11 years of the 21st century nearly 8 out of ten people affected by natural disasters worldwide lived in India or China. Ever thought about starting a group, an organisation or a club? Maybe you already did and are interested in other people’s experiences. Maybe you haven’t but have a deep yearning to start your own nonprofit. Got an interest you want to share, teach and form a club around? Perhaps you are just curious about other people’s experiences of starting something. Any which way, hear from people who have taken the idea to action.